During the 2017 CES, Panasonic announced the Lumix GH5, the first mirrorless camera that can record 4K-quality footage at 60 frames per second. An update to the highly lauded GH4, the first mirrorless camera to shoot in 4K, the GH5 captures both Full HD and 4K footage without the time limits normally posed by cameras. A new sensor with a 1.7 times faster signal readout, paired with a processor that’s 1.3 times faster than the predecessor’s, allows this video-centric camera to capture 4K in 60p/50p, Panasonic said. The GH5 will be able to capture video in MOV, MP4, AVCHD Progressive, and AVCHD formats. The point here, after got an Panasonic Lumix GH5, you will find it a painful experience to edit GH5 4K footage in non-linear editing systems (NLEs). Yeah, with every new camera, come many new questions about workflow. The term “workflow” can be fairly broad, but today I will show you an easy way to import Panasonic GH5 4K to Final Cut Pro X/7, Adobe Premiere Pro, Avid Media Composer and iMovie for further editing. The easy workaround to work Panasonic DMC GH5 4K with FCP X/7, Premiere, Avid and iMovie is to transcode DMC GH5 4K footage to a more editing-friendly format. 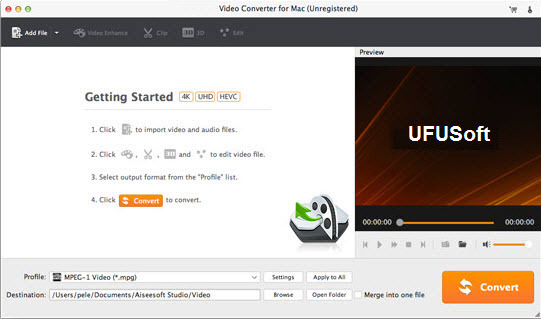 The process is surprisingly easy and can be done with the help of UFUSoft Video Converter for Mac (or Video Converter for Windows). The program can effortlessly encode/re-encode Panasonic DMC GH5 4K MP4/MOV, AVCHD footage to advanced encoders like ProRes, MPEG-2, Apple Intermediate Codec, DNxHD etc.x to seamlessly fit for Final Cut Pro, Adobe Premiere Pro, iMovie/FCE, Avid Media Composer and more. Just download it and keep reading for a brief how-to on each process. How to import Panasonic GH5 4K MP4/MOV or AVCHD footage into FCP, Premiere, Avid and iMovie? Run the program you just set up. Drag and drop GH5 4K video files to the converter. You can also hit Add files button to import videos to the app. If you wanna combine several videos into one file, you can select all files and click Merge. 1) For Final Cut Pro, click the “Format” bar and select Final Cut Pro> Apple PreRes 422(*.mov) as output format. 2) For Adobe Premiere Pro, just choose Adobe Premiere/Sony Vegas -> MPEG-2(*.mpg) as output format. 3) For Avid Media Composer, just choose Avid Media Composer->Avid DNxHD(*.mov) as output format. 4) For iMovie, just choose iMovie and Final Cut Express -> Apple InterMediate Codec (AIC) (*.mov). Finally, click convert and your Panasonic DMC GH5 4K MP4/MOV or AVCHD video files will be converted into editable files ready to be imported into FCP, Premiere, Avid and iMovie.